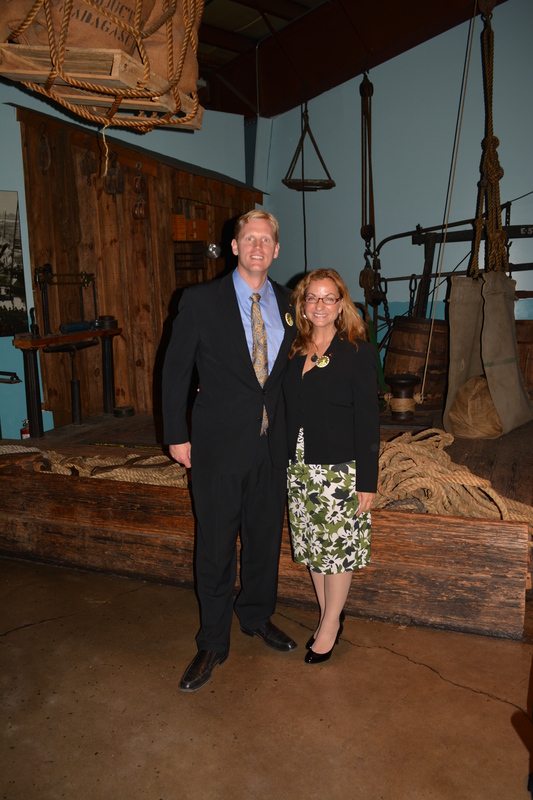 Last night, I attended the OTA awards recognizing Leadership in the Organic Foods Industry. Organic became an industry started by idealists like my father, as a response to farming with toxic chemicals. These committed few believe, as I do, that poisons don’t belong in the food supply. Ask any mother and she’ll tell you that she doesn’t want to feed even trace amounts of carcinogens and hormone disrupters to her children. Several joined the caravan and the few became an “industry”. Fast forward several years and things are looking brighter as the industry has grown from a seed into a sapling. But we now have to contend with unsustainable GMO agriculture. Instead of decreasing their use, GMOs have exponentially increased pesticide and herbicide use in a misguided mono-crop disaster. 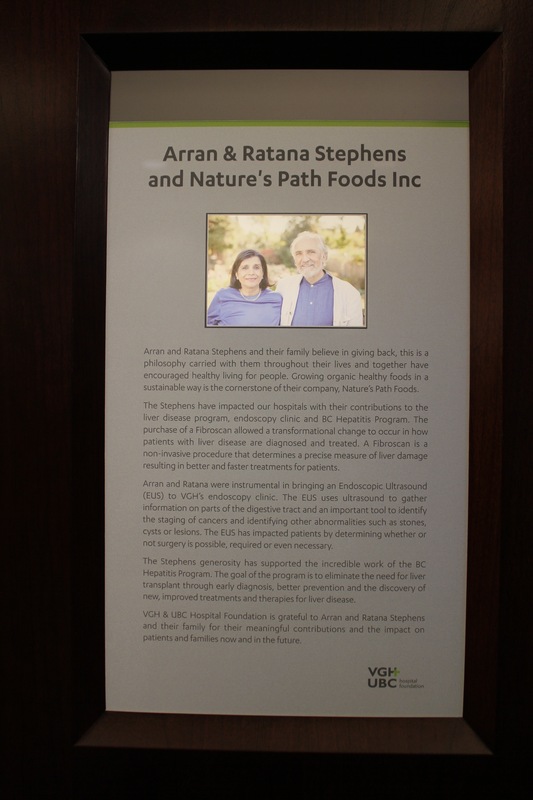 The first award was presented to my parents Arran and Ratana Stephens, of Nature’s Path Foods. 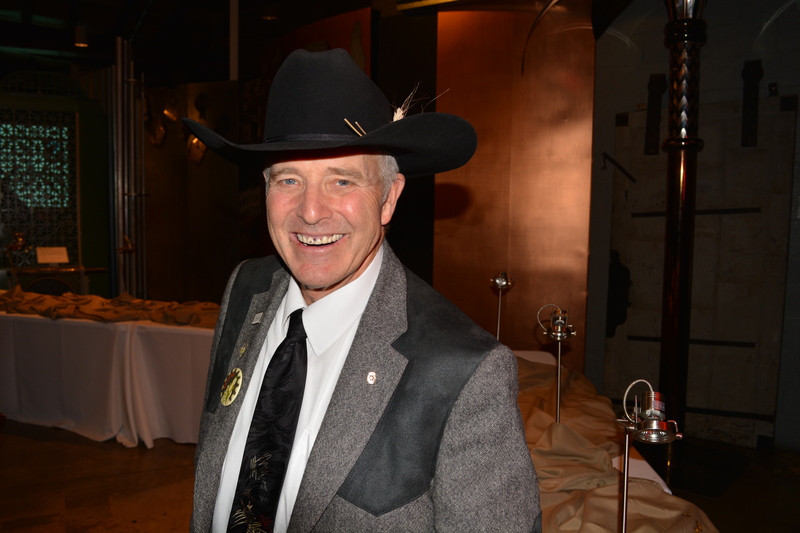 They were honoured with the Growing Organic Industry Award. When recently asked if Nature’s Path was a non-profit activist group or a consumer foods company, Dad answered “Both”. I’ve copied his and mom’s inspired acceptance speeches below. The Second Award was presented to Kyle Mathison of Stemlit Growers for Organic Farmer of the Year Award. In a rousing speech which made my mouth water, Kyle spoke about his quest to grow the best, most juicy, luscious fruits. He has helped advance solutions in orchard weed control, organic fertilizer, integrated pest control etc etc. Kyle, a fourth generation farmer from Washington, made me salivate as I flashed though my most memorable fruit experiences. That peach I bought in Montreal, those figs from Florence, the sweet muscat grapes from France that tasted like candy, ripe mangoes from India that defy description. The Apples dad has espalliered. I wish I had the text of his speech so I could make you salivate too. The third and last award of the evening was presented to Karen and Colin Archipley: the Rising Star Award. Colin is a war veteran who founded the Veterans Sustainable Agriculture Training program. Helping veterans, who face employment hurdles after leaving the military, Karen and Colin create a link between jobs for vets and organic agriculture on Archi’s Acres in California, their organic hydroponic farm. Talk about literally turning swords into ploughshares! They recently helped plant the White House’s Organic garden. During their acceptance speech, Colin made everyone in the crowded room raise their hand and pledge to be Semper Fidelis. This is a Marine Motto. Always Loyal. It was a lovely gesture. From a former marine leading the pledge (whose opening I solemnly swear reminded me of the marauders map), it was powerful. If anyone had been unsure about the zealous commitment to Organic farming, this dispelled any doubts. I saw Bob Quinn the KAMUT grower on my way out. Bob and I spent many years bumping and into each other at European Trade shows. No matter where I was or what my mood was, Bob made me smile with his killer smile dressed in his cowboy boots and hat with two sprigs of Kamut in its band. Kamut (heirloom wheat found in an Egyptian tomb and subsequently planted in the midwest) has higher protein content and superior nutritional content to modern wheat. It also doesn’t cause bloating. Only organically grown, Kamut, which is trademarked, is growing literally by leaps and bounds since I last saw Bob. Bob tells me that over 70,000 acres are dedicated to the organic sowing of Kamut! That is great news for Kamut growers, happy tummies and the planet. Thank you for bestowing this honor upon us. We are privileged to be recognized. This journey has been a labor of love. It is to create a better world for our children, grandchildren, and the children of the universe. A success is a failure that never gave up. There’s no substitute for patience and persistence. Never compromise core values and principles. Business and the market are in constant flux, VALUES never change. On behalf of the many, Thanks for the Award! 2 1/2 years ago, lying in the ICU ward, my life was dangling from a very slender thread, hovering somewhere in the void between life and death. It seemed then, in some strange way that I had a choice—to go into the Beyond or stay on and complete some unfinished aspects of this existence. I chose, or so it seemed, to live on. Having been granted a life extension, I re-dedicated whatever time was left to serve the Creation in some small way—on the one hand to nurture and protect the fragile earth, to help fulfill the destiny of our enterprise, Nature’s Path and ensure its smooth succession to the next generation, to be there as a loving father and husband, and on the other hand, to continue to evolve as a human and spiritual being. I have always felt a kinship with this spiritual, but non-religious Father-Mother aspect of existence. Over the past seven decades. 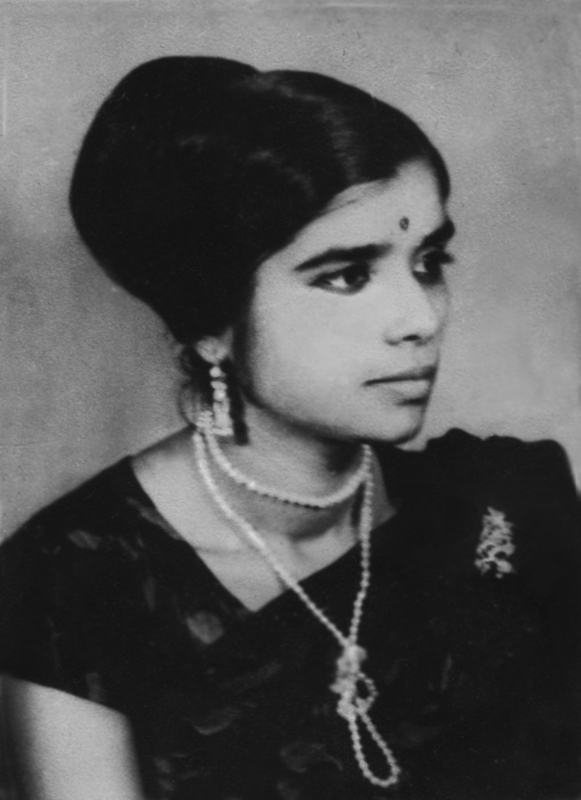 I have been much blessed to have been raised by loving parents on the family farm on Vancouver Island; to have lived in India; to have married one of her daughters; to have been blessed by her Saints, to have been constantly involved in the organic movement since 1967, before there was an industry, to have, with my dear wife of 44 years, and our four children–Shanti, Gurdeep, Jyoti and Arjan) built an inter-generational legacy of Nature’s Path, without selling out! For our friends in the investment community, no part of NP is for sale, just to save your and our time. We have made many good friends over these decades, many of whom are in this hall tonight. We honor you all, we love you all. To all who are part of the burgeoning organic industry, starting with our unsung heroes: family farmers, suppliers, the hundreds of Valued Nature’s Path Team Members, wholesalers, retailers and last but not least, our millions of customers, we salute you, for without you, we wouldn’t be here. With modern methods of chemical agriculture, using fossil fuel based fertilizers and attacking pests with massive amounts of pesticides and herbicides, we are short-sightedly destroying the long-term fertility of our soil bank, depleting it at the expense of future generations. In less than 20 years, since the first GMO crops were introduced, more than 90% of soy, cotton, sugar beets, canola, and Hawaiian papayas now contain alien gene traits. There have been no long-term safety GMO trials, which makes us part of an unprecedented feeding study, but we are not lab rats! Nor are GMOs even labeled, yet they are in 80% of supermarket foods. GMO crops are failing their maker’s promise to provide greater yields, toxic herbicide use has gone up 15 fold, allergies have increased three fold in the short two decades since GMOs were introduced into the North American agricultural system. Predicted super weeds have developed resistance to herbicides, contaminating more than seventy million acres in North America, now requiring even more deadly chemicals to eradicate them. Thousands of unique species of plants and creatures are lost every year. Instead of cooperating with nature as we should, as guardians or trustees of our land bank, modern science and short-sighted consumerism is waging war against Nature. And this has many of us disturbed. Biotech companies are interfering with evolutionary processes that have taken thousands—even millions of years to perfect. Genetic modification is not a continuation of selective breeding, but the significant alteration of life forms. And the outcomes are haphazard and unpredictable. Organic agriculture and soil conservation is the only bulwark against this tsunami of ecological mismanagement. Because we are concerned that good organic farmland is being lost due to ageing farmers retiring with no heirs to take their place, we have begun to buy good farmland, with a cooperative crop-sharing model. It is working, but with the rate of demand exceeding supply, we desperately need more young organic farmers. We are grateful to be a part of the organic solution. You are, or can also be a part of the solution. A new, caring economy is needed. A fresh paradigm of conscious capitalism, if I may borrow the term, a new generation of idealist-entrepreneurs is much needed. There is hope, and I am an optimist. I will fight for the good of the earth so long as I live, and until the I that is my body becomes the earth, while the I that is my soul soars free from its temporal fetters to merge the lesser light with its Source in the greater Light. How could this all be given to a guy like me? This entry was posted in Arran Stephens, Food heros, Mom's advice, Organic, Ratana Stephens, Sustainable Business, The Environment, The Triple Bottom Line, Trail-Blazers and tagged Acceptance Speech, Archi's Acres, Baltimore, Bob Quinn, Genetically modified organism, GMO, Heirloom wheat, Kamut, Karen and Colin Archipely, Kyle Mathison, Nature's Path, Nature's Path Foods, Organic Farms, OTA Awards, Stemlit growers, Veterans Sustainable Agriculture Training on September 26, 2013 by Gurdeep Stephens. In his book Vanishing Vancouver, Michael Kluckner explained how certain he was that the J.W.Leek House in Point Grey would be a casualty of Vancouver’s rapid growth. 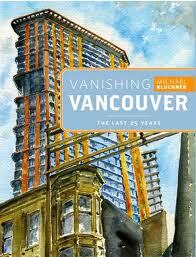 Michael Kluckner is an artist and author of several beautiful books chronicling Vancouver’s history. 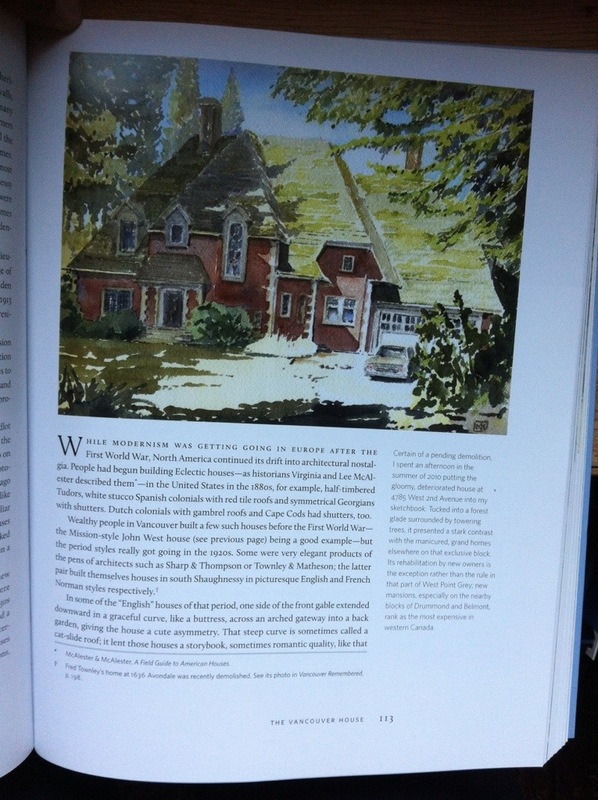 He was familiar with the house, which was designed and built for a time where Vancouverites grew most of their own food and lived in more modestly-sized homes. Michael went with his paintbrush and with a certain wistfulness, made a watercolour of the house which was surely destined for demolition. It features in his book published in 2012. Michael didn’t know that my parents wanted to purchase the house. Mom and Dad had gone by the house often and wanted to restore it to its former glory. I shared their vision. Together with my parents, we undertook a daunting renovation of the Leek House after purchase in 2010. So much was going on at the time. My father was at end-stage liver failure and I was gearing up to be the organ donor. We had more than enough things going on both personally and professionally. 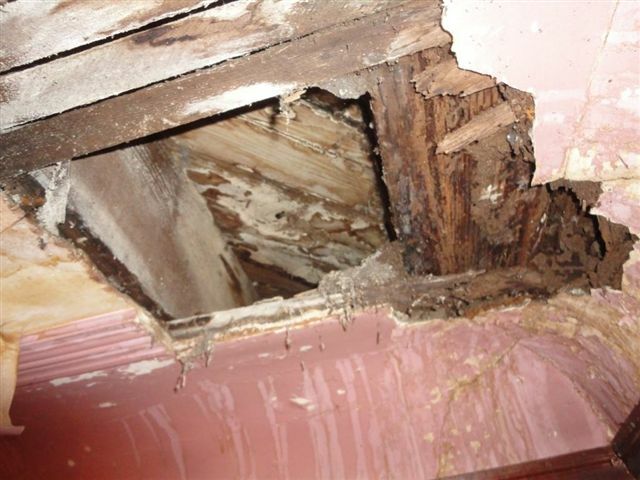 Some interior photos before the renovation, showing holes in the walls and ceilings and roof. Stains like these were all over the house. They were either water or animal urine…. In the living room, this hole was above the sofa. Which had ferns growing out of it. Green house? When dad explained that our mandate was to renovate (not demolish), the contractors we asked to bid on the job looked at us bug-eyed as if we were bat s— crazy. 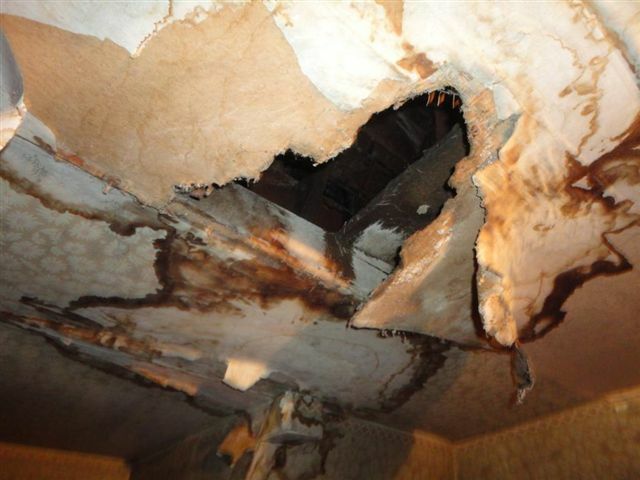 The roof had holes so extensive that ferns were growing out of the living room sofa. The place stank sickly sweet of rot exacerbated by the various wildlife living in the house, including a family of raccoons. 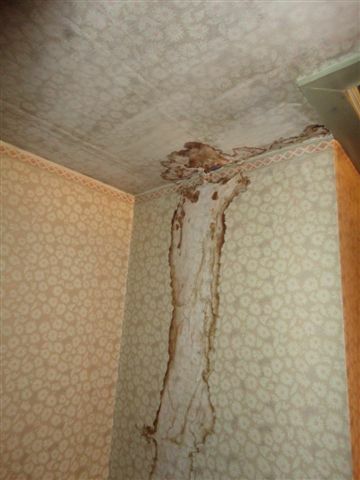 Sean Pearson, our architect at RUF project got reactions every time he went in to take measurements, being allergic to mould. Dad, who was in dangerously frail condition medically, had to be hospitalized after he visited the home and didn’t wear a mask. It was cleaned out by a crew in bio hazard suits. Back Garden post reno. Dad’s original design was to replace the fallen, rotten, dead and dying fruit trees with a gently sloping landscaping and dozens healthy fruit trees and dozens of healthy cedars. Every tree that had a hope for health, including the walnut that stands at an angle, was preserved and nursed to optimal health. The area where the lawn is divided into squares,was before the reno, a mossy rectangle. 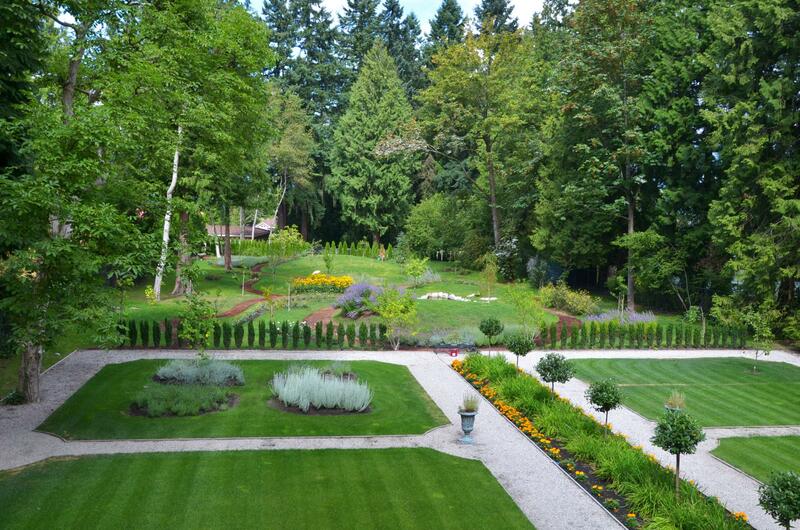 The original “backyard” was a something out of Sleeping Beauty’s enchanted forest. Enchanted as in dark magic and evil: briars and brambles 15 feet high made it impossible to traverse the backyard. We tried. We might have been successful with a machete. A derelict and diseased orchard had gone to seed and created a hazardous situation for neighbours and visitors alike: several fallen trees, many of which had crashed onto the neighbour’s yard. The City was even called upon to remove trees that fell onto and blocked the back lane. These trees, mostly fruit varieties planted when the house was first built, were in such dangerous condition that the city had written to the then-owner to remove them. She never did. The city forgot. They did have copies of the letter, however…. My dad cleaned up the dying trees all of which were already dead, already fallen down, and or certified dying by an arborist. These trees were so obviously dead, that it didn’t take an arborist to attest to their shape. Several were little more than standing rotten logs covered with ivy. Fellows who went in to help with the dangerous trees called them ‘widow-makers’, a common lexicon of woodmen which refer to a trees certain to fall. Entry way post reno. 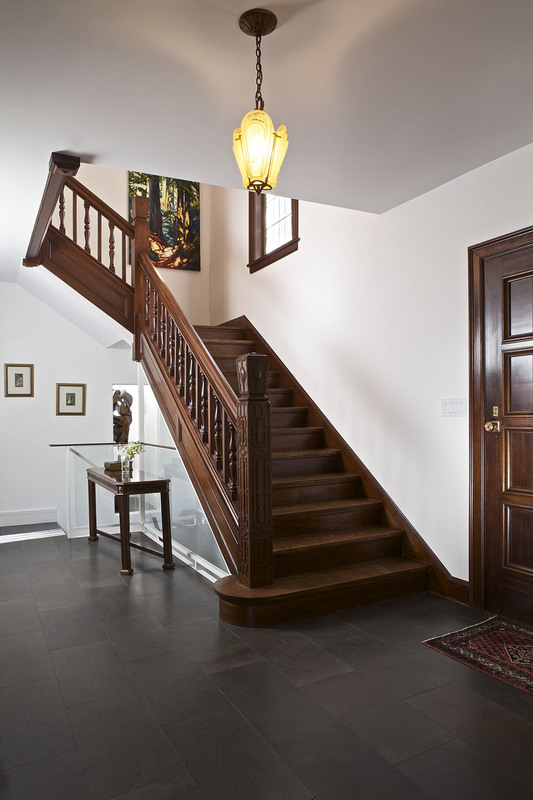 Note the original staircase which we protected during the reno and then restored. The lighting fixture is original to the house. We were advised to scrap the front door. We refurnished it instead and it’s gleaming. Post reno Room. 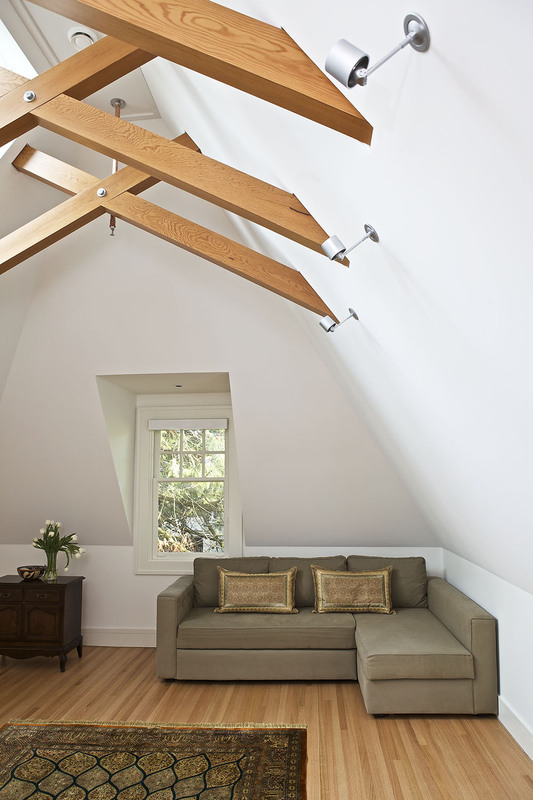 Architect and Design firm RUF Project used beams both as structure and sculpture. This room was short-listed for best room for the BC Builder’s Association Awards. Other rooms included Best Kitchen reno, Best Bathroom reno, and Best Overall. Living Room post reno: Note the original lighting fixture and windows. We remade the 1930’s coved ceilings in the original style. Not throughout the house but in the living room to give a nod to times past. We managed to keep the original tiling in the bay windows. 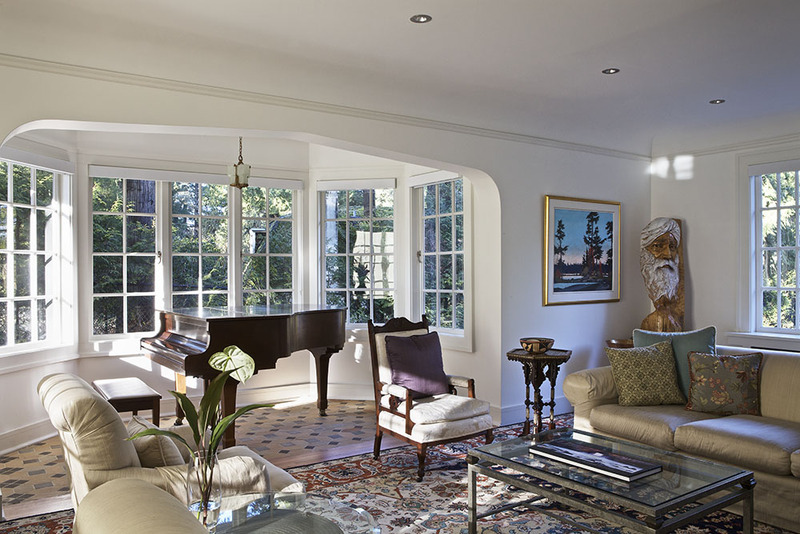 G Wilson Construction found a way of preserving much of the original flooring in this room. We also kept the original radiator covers and decor. Too beautiful to throw away. The façade though some of the many trees on the property. Several of the trees in the back yard were dangerous and deemed Dangerous by the City back when several fruit trees toppled onto the back lane and the neighbour’s property. The house had good bones, a solid foundation and good-luck coming. Fast forward to 2013, skipping over trials, tribulations, tears, hard work, the ingeniousness of an amazing team, and sweat too… The builder was G Wilson Construction and the architect and designer RUF Project. Both told us it would be cheaper to rebuild. 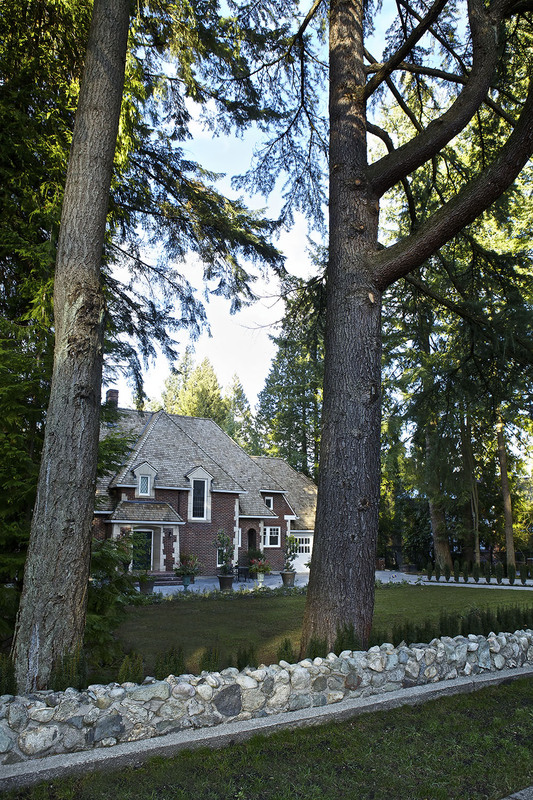 But they agreed to work with us to preserve a piece of Vancouver. 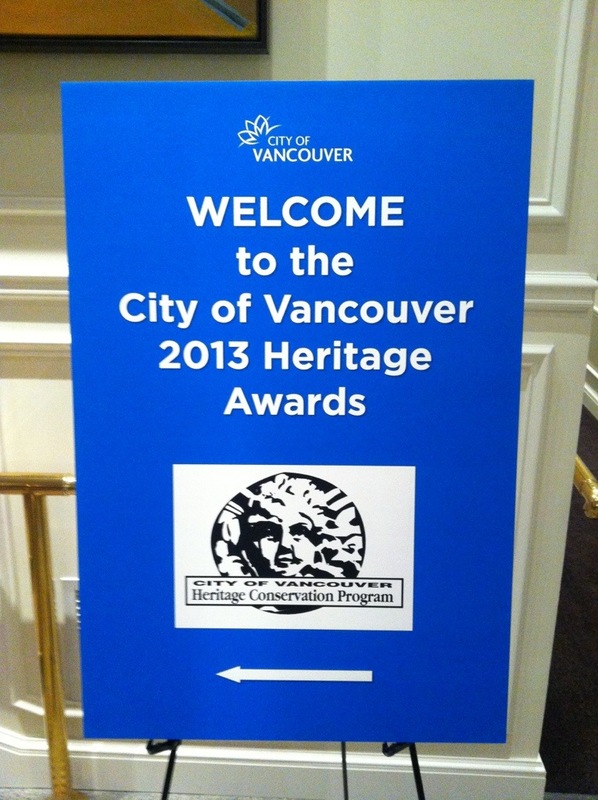 The revitalized house has won several awards for renovation including a Georgie, BC Builder’s Association Award and most recently the City of Vancouver Heritage award. I attended the City of Vancouver Heritage awards and was so proud of dad when he said, “in everything we do, leave the earth better than we found it.” This is the legacy we must all leave. 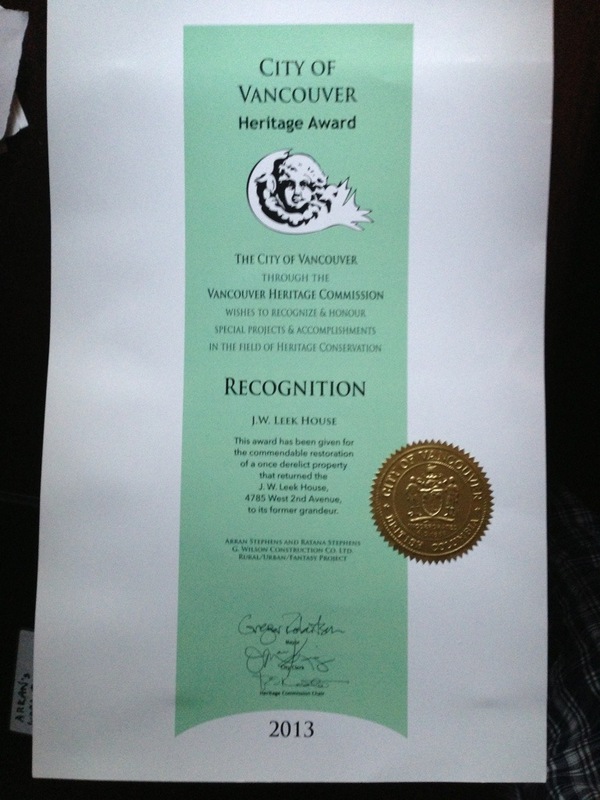 City of Vancouver Heritage Award. One of three major awards the renovation won. We had an open house as part of the Parade of Renovated Homes sponsored by the BC Builder’s Association. Both RUF Project architectural firm and G Wilson Construction were awarded several honours for this project. And we were all overwhelmed by the positive outcry of the public, neighbours, builders, architects and designers. The entire team had made something historical, beautiful, delightful. All it takes is vision. Of which my mom and dad have in spades. Envisioning and making charge, I am delighted to be a part of the movement to preserve where ever possible. The Georgie Award. Rather like an Oscar…. As we shape our future history, we must cherish the architecture of the past. Which ties us back to our present. Amen. This entry was posted in Arran Stephens, Gardening, Ratana Stephens, Trail-Blazers and tagged 4785 West 2nd, BC Builder's Association, BC Builder's Association Award, City of Vancouver, City of Vancouver Heritage Award, Dangerous trees, dead trees, difficult reno, G Wilson, G Wilson Contruction, Georgie Award, historical property, Home Reno, J.W. Leek House, Michael Kluckner, Parade of Renovated Homes, renovation, RUF, RUF Project, Stephens house, Stephens house point grey, Trees, trees that fell into back lane, Trees that fell into neightbours property, Vancouver, Vanishing Vancouver, widow-maker trees on August 9, 2013 by Gurdeep Stephens. 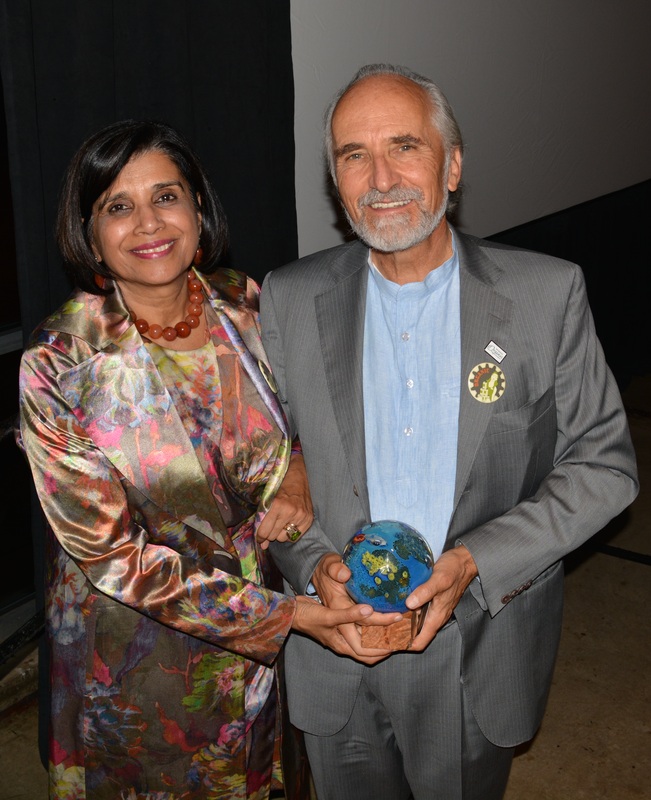 Arran and Ratana Stephens, my parents, have recently been honored for their passion and commitment to the organic food movement. I wasn’t surprised by the award but I was surprised by the fact that this story was picked up by the Wall Street Journal. Organics is growing movement, a movement for food democracy, health, and planetary well-being. More and more people are waking up the dangers of toxic pesticides and herbicides that our foods are typically drenched in. Although my family has supported GMO labeling since the beginning, my battle became personal this Spring when I started to understand how little my peers know about them. Everyone agrees that whether you think GMOs are healthy or harmful, we should have the right to know if we are eating them. My dad was asked to answer the following questions about GMOs. 1. What potential effects do GMO’s present? Up to this point, neither government nor industry has provided any long-term safety studies on human or animal health from consuming Genetically Modified Organisms (GMO) foods in our daily diet, making us all guinea pigs in the biggest feeding experiment in human history. GMOs have not been proven safe, and nearly 64 countries—including Russia and China—have significant restrictions or outright bans because of this. We are now starting to see a growing body of research, and the results are pointing to potential negative health effects like pre-cancerous cell growth and tumors, damaged immune systems, infertility and more. Couple this with the negative effect on our environment and the potential impacts are too great to ignore. 2. What do consumer’s need to know about GMO’s and their consumption? Consumers need to know that GMOs have not been proven safe, and they do not have to be a part of this huge science experiment – they have the right to know what’s in the food they are eating and feeding their families. In 2013, 95 bills related to the labeling of GMO foods were introduced in 28 states, including I-522 in Washington. Now is the time to learn more, spread the word and vote for your right to know, so you can make an informed decision about the food you buy and feed to your families. The best way to avoid GMOs is to choose food that is USDA certified organic, which prohibits the use of GMOs, and Non-GMO Project Verified, which means it went through rigorous third party testing to bear the seal. At Nature’s Path, all of our products are both organic and Non-GMO Project Verified, so consumers can feel comfortable knowing our products avoid GMOs. 3. What does organic mean, and why is this movement important? Organic means that food has been grown without toxic, chemical pesticides and herbicides, GMOs, antibiotics and artificial growth hormones. Organic is the gold standard, and your best way to avoid GMOs. Non-GMO Project Verified products have been tested for GMOs – which is incredibly important – but it doesn’t mean they are organic, so they most likely have been grown with toxic and carcinogenic agri-chemicals such as pesticides, herbicides and fungicides, and fertilized with fossil-based fertilizers which harm the environment. The only way to have both Non-GMO and the numerous, additional benefits of organic food, is to choose products that bear the USDA Certified Organic Seal. It’s not hard to imagine why this would be better for people and the planet and there is a growing body of research that is beginning to show the health and environmental benefits of organic food. 4. What is the argument for GMO’s? ‘agroecological methods [without the use of GMOs] can outperform the use of chemical fertilizers in boosting food production where the hungry live,” and that “conventional farming relies on expensive inputs, fuels climate change and is not resilient to climactic shocks. It simply is not the best choice anymore today.” We’ve seen people in Haiti, who desperately needed food, burn GMO seeds that were given to them, considering them a kind of Trojan Horse – we need to help feed the world with food that has been proven safe and nourishing, not genetically engineered and filled with chemicals. Another claim from the biotech industry is that GMO crops use less pesticides, since the Bt toxin pesticide is already spliced into the GMO seed. But, since the introduction of GMO crops, toxic, carcinogenic herbicide use has gone up over 1,000%, as these GMO seeds are bred to resist the application of herbicides which kill everything else on the fields, not just weeds. This entry was posted in Arran Stephens, Food heros, Mobilize and March, Organic, Ratana Stephens, Right to Know, Sustainable Business, The Environment, The Triple Bottom Line, Trail-Blazers and tagged Arran Stephens, Genetically modified organism, GMO, Nature's Path Foods, Ratana Stephens, Wall Street Journal on July 24, 2013 by Gurdeep Stephens. I see people holding to their ideals. My mother Ratana and sister Jyoti gave a talk yesterday at the Social Venture Institute. Jyoti has been championing sustainability at Nature’s Path even before she got her Green MBA. 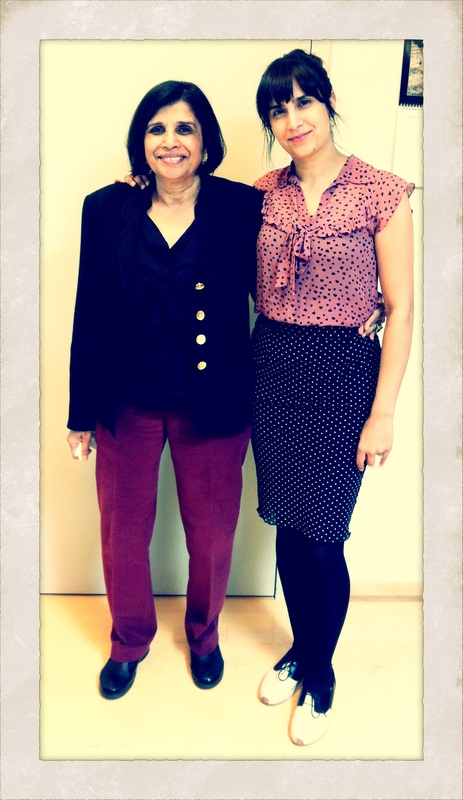 My mom, co-founder of Nature’s Path, steers the company forward with vision, style and a sense of greater purpose. With their beautiful voices and complementary speaking styles, they got a well-deserved standing ovation after their talk. This entry was posted in Jyoti Stephens, Mom's advice, Ratana Stephens, Sustainable Business and tagged Jyoti Stephens, Mom's advice, Nature's Path Foods, Ratana Stephens, Social Venture Institute on May 3, 2013 by Gurdeep Stephens. On this Earth Day 2013, I see a world where it is becoming ever hipper and cooler to garden and farm organically. He kind of hummed and hawed and mumbled for a bit. My phone rang so I left. About half an hour later or so, I bumped into him again. “Hey Deepie, want to hear what I’ve been writing?” he asked. My friend Nathalie Chambers was there, talking about conservation of farmland (more on that in the future). Dad read the following out loud to us. Nathalie was crying by the time he finished. Me too. “Dad,” I said, “I have to share that on my new blog”. Dad and mom are my heroes, more so every day. Dad founded Vancouver’s first vegetarian restaurant called the Golden Lotus and established Vancouver’s first super-market size Health Food store called Lifestream in the late 1960s. An idealist driven to business in order to advocate for the Earth, Health, Organic Farming and Ethical business practises, my parents are inspirations to thousands. Dad has been called a ‘folk hero”, “hippie capitalist” among other names. To me he is a loving, kind, and firm father with a fierce sense of justice. When he feels that something is ‘right’ or ‘wrong’, ‘just’ or ‘injust’, he will stop at nothing to stand up and say so. My Mom is a determined mother bear and lioness. She also has that uncanny common sense with the wisdom of Solomon. They are a fierce team. In case you are wondering, the goal of “The Deeper Side Blog” is not to promote my parent’s or their company but to use them and many many others as beacons of light, as shining models; templates of success for those searching to creating meaning in life. I was thrilled to hear from Tricia Millhouse Walter feeling moved by despair about the conditions of children in her neighbourhood and transforming that energy into positive action by working for the non-profit ‘Corazon’. She posted on my first ‘blogger’ post and I’m not sure that came through. She is another example of people moved to ‘be the change’. Although I’ve started this blog talking about the right of the seed, I am brewing and steeping with overflowing words in my bottomless teapot of ideas. I’m just wondering which one to write next – and trying to find the time! I could write this blog 15 hours a-day, not eat or sleep (Yeah, I’m a little obsessive). Here is the Earth Day message. could she bear such a burden? This entry was posted in Arran Stephens, Ratana Stephens and tagged Arran Stephens, Corazon, Earth Day Message, LIfestream, Nathalie Chambers, Nature's Path Foods, Organic farming, positive change, Ratana Stephens, Tricia Millhouse-Walter on April 22, 2013 by Gurdeep Stephens. I dream of a world where we breathe healthy air and dig in healthy soil. Where streams run clear and pure. Where organic farmers cultivate with pride and dignity and freedom to plant the seeds they themselves sow and save for the future. 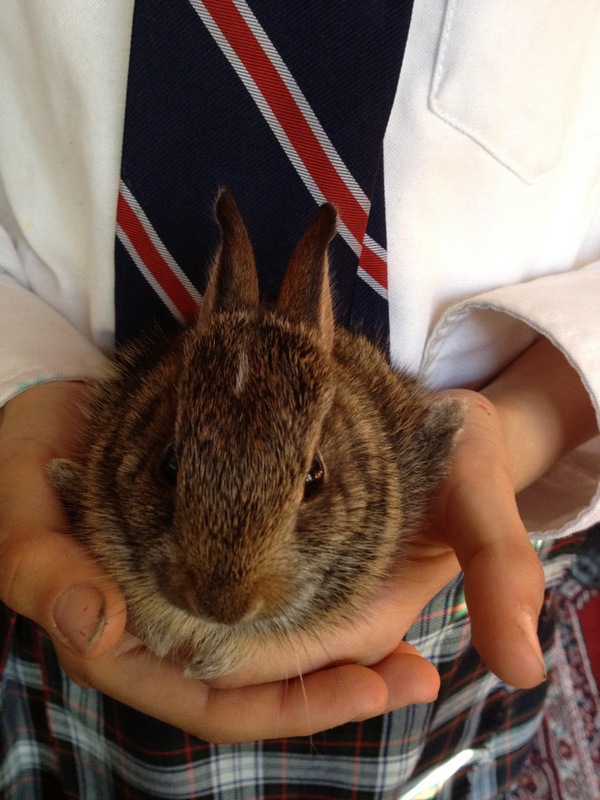 My daughter Diya holding a wild wee baby bunny. The bunny didn’t hop out of her hands. I will set up the first of this two-part post with an impressionistic portrait of Isha. She is my six year-old with a flair for the dramatic, like her older sister Diya. You will remember Isha if you have ever had the – ahem – pleasure to have met her. She is intense, loving, naughty, rambunctious (why is that so hard to spell?) and takes up a lot of energy. She also has a iron sense of justice. Did I mention that she is outspoken? Even for a 6 year old. On the ferry the other day, I met a fellow school parent who had hosted Isha at his daughter’s 7th birthday party. “Oh, so you’re Isha’s mom? !” he said with surprise – not quite masking his slightly apprehensive tone. We hadn’t met. He looked a little scared. “HmmmUmm,” I smiled, and murmured, brightly bracing myself and showing all teeth. I’m just putting that out there for you to digest while I set this up. It’s called blunt foreshadowing. In yesterday’s post, I wrote about how Dr. Vandana Shiva shifted something inside me. 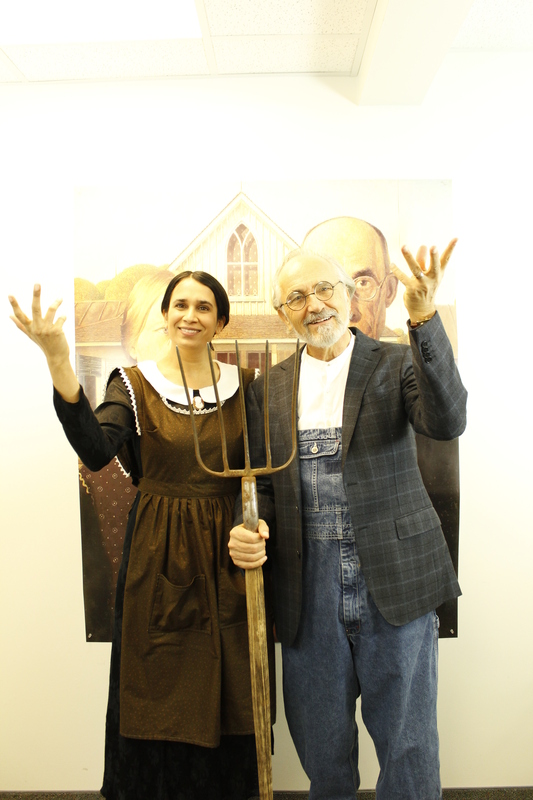 I come from a pioneering organic family. My grandad Rupert turned to organic methods loving the lowly-earthworm when his peers on Vancouver Island were turning to synthetic pesticides and herbicides. Rupert also was a song-writer. He loved to write songs about the beauty of the Earth and farming. 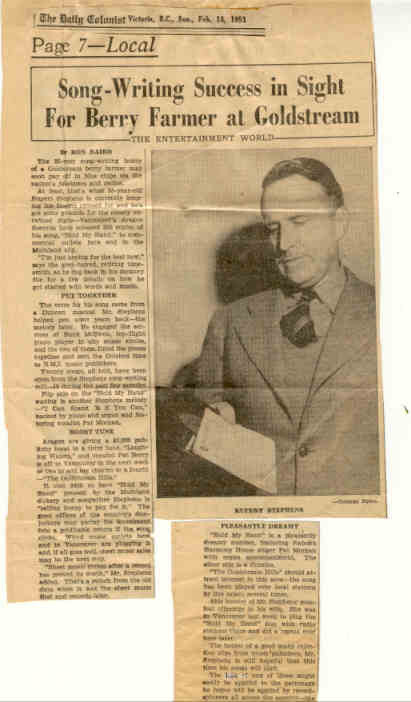 Rupert Stephens, my song-writing, organic-berry farming, pacifist grandfather. 2) organic is better = no pesticides and herbicides yay! The GMO-proponents at this British debate were arguing that they significantly reduced pesticide use through this technology. Again I was thinking, how can you compete with organic? In organic farming the soil is enhanced, not depleted. Pesticides and herbicides not only kill biodiversity but kill farmers. Big-agri food business sees that side as an unfortunate but necessary by-product of food production. Again, I reminded myself that I was there with an open mind. If they could radically reduce pesticides and herbicides use, I might be impressed. But I wanted to see the data. Better, if they went organic, of course, but I again I was going with a relatively open mind. Riiight? If they were invited to give their best arguments, dressed to their corporate best (like moi, of course) at the august Houses of Parliament, they had to be bringing some pretty gosh-darn amazing data. I held my breath waiting for the evidence to show up on the screen. Did the well-heeled Brits and Americans see what I saw? I zoomed in on the chart proudly titled something like ‘Reduction in Pesticides and Herbicides in GMO Crop Sample study’ . I was looking for the significant difference. Did they make a mistake? Was this the ‘before’? Nope. I checked the title again and looked at the dots and lines. This had to be their ‘great scientific evidence’? But was this the very best they could do? The reduction in pesticides from ‘conventional’ to GMOs production was *minimal*. With the variance, it seemed hardly a difference to my eyes. The GMO proponents kept using the words “statistically significant” and pointing to the chart. I squinted, turned my head this way and that way. Okaaaay, like significantly lower by a bit. But not enough to my eyes. Like me, they were not persuaded. Confronted with all these screaming red warmings about GMOs, I had been getting more perplexed and wrestling with my disquiet. I still didn’t want to write a blog about this. I thought we were doing enough. Others were doing enough. I thought I was doing enough to support organic and local producers with each and every meal. My family has been supporting organic farmers in several ways for years. My father Arran was the first to found and certify an organic breakfast food company. First my grand-parents Rupert and Gwen, then dad Arran, mom Ratana, sister Jyoti, little brother Arjan, my sister Shanti and brother-in-law Markus all produce, market and manufacture organic foods. It have never simply been a job to provide people with delicious nutritious foods. My family ethos is steeped to further the agenda of our planet. Socially responsible, Environmentally Sustainable, Financially Viable. We have been leaving the soil better than when we found it for decades. But I still wasn’t ready to write about this on a blog. Fast-forward to about 2 weeks ago. Drum roll please!! Now, if you really and truly want to know what has given me a kick in the pants to write this blog, you need to hear this amazing lecture. Right now. Click on it above if you didn’t click on it above. Listen to the lecture. Share it with your friends, discuss it with your children, enlighten your parents. You will really understand what GMOs are all about from the winner of the Alternative Nobel Prize. Dr Vandana Shiva gave this lecture at the University of Victoria on March 27, 2013 where she was awarded an honorary doctorate. This lecture changed me. Whereas I was quietly doing my part, after this lecture, I wanted to turbo plant seeds of understanding, knowledge and stand up and wave my arms. Her lecture has changed my life. This entry was posted in Arjan Stephens, Arran Stephens, Dr Vandana Shiva, Jyoti Stephens, Ratana Stephens and tagged Agriculture, Genetically modified organism, GMO, GMOs, Organic farming, Vandana Shiva on April 17, 2013 by Gurdeep Stephens.